Well its late Monday... but I'll still post my plan. Dinner got a way from me tonight - hot nights make it hard to cook - especially after a relaxing day of wine tasting! So I am starting with Tuesday. I have some good foodie photos to post and write about... I just haven't yet. I'll try soon. 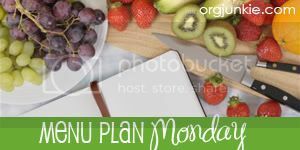 More plans over at orgjunkie! I want to know how the Black Bean Asian Tostadas are! They are really yummy, this is actually a recipe my dad makes... I got it from him. I'll post the recipe and some photos.